The HDM standard Non-Adjustable Bearing Cassette is designed to fit standard 1 1/4 Rear Bearings. This cassette is CNC machined from 6061T6 aluminum. The HDM Bearing Cassette is designed with most all major chassis in mind. It has the 3-bolt pattern found on most chassis as well as the pattern for the Banshee® and Nemesis® chassis. Bearing is not included. This cassette will NOT accept the large O.D. 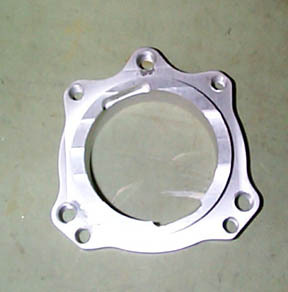 Sealmaster bearing. - 2-6-10 Round Bolt Pattern - 3/8-16 @ 3 9/16"
- Square Bolt Patten - 5/16-24 @ 2 9/16"
- 3-6-9 Round Bolt Pattern - 5/16-24 @ 3 9/16"
Thanks to Jim Abbett with Abbett Racing for this picture. Nemesis & Banshee are trademarks of Phantom Chassis/Wiggins Kart Shop.